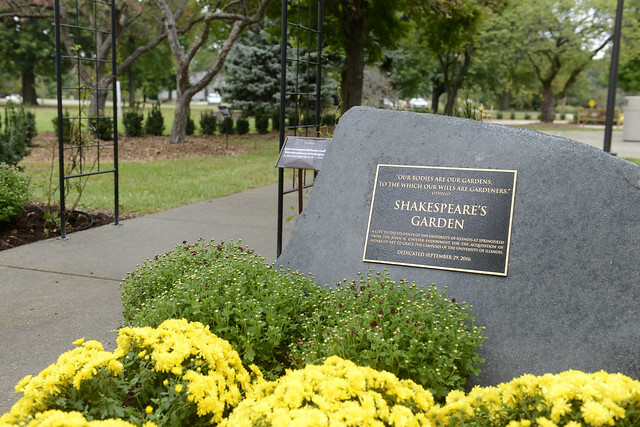 The University of Illinois Springfield unveiled a new Shakespeare Garden on September 29, 2016, marking the 400th anniversary of the poet and playwright’s death in 1616. The unveiling ceremony included the reading of Shakespeare sonnets, period music and remarks. The themed garden, located in the Patton Park area just north of Brookens Library, features plants often mentioned in William Shakespeare’s work. It includes signs near each plant with the relevant quotation and reference to the appropriate play or poem, as well as a fountain, walkways and benches. “Thanks to a generous gift from the University of Illinois Chester Fund, this new Shakespeare Garden is giving new life to Patton Park – creating an educational resource and a place of enjoyment for students, faculty, staff and visitors to our campus,” said UIS Chancellor Susan J. Koch. 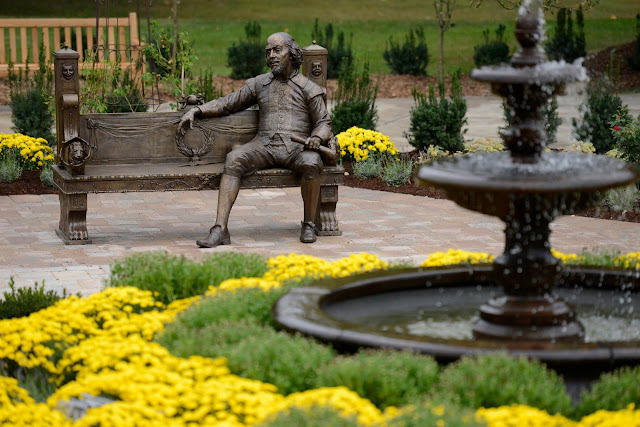 The centerpiece of the Garden is a life-sized bronze sculpture of the writer, titled “Shakespeare,” by renowned sculptor Gary Lee Price. The sculpture depicts Shakespeare relaxing on a garden bench – an open invitation for visitors to sit beside him for a chat or a photo. Shakespeare is widely regarded as the greatest writer in the English language. He often used plants and gardens as metaphors for life, with many important scenes taking place in garden settings. Other Shakespeare events happening on campus include, the UIS Theatre production of “Macbeth”, October 28-30 and November 3-6 and the ECCE Speaker Series screening of the documentary film “Shakespeare Behind Bars” on November 7.